Zelda's more aggressive form from Melee has returned! For many of the advanced strategies regarding Zelda/Sheik, many players turn to Sheik, but that doesn't mean Zelda isn't a good fighter too; they are different and attract different types of people with different playing styles. 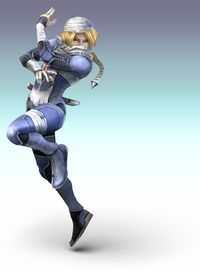 Sheik is still the fast and aggresive fighter like in Melee, but her attack power is severely weakened. She also lost her old down throw chaingrab. This loss of power means most people turn to Zelda when it comes to actual KOing. Regardless, Sheik is still a fun character to use and is pretty good without relying on Zelda. When using Sheik, try to store as many needles as possible, they usually aren't used to actually attack, more like defend, they can distract people, destroy projectiles that are about to hit you…the list goes on. Highlight Zelda on the character-selection screen and tap in any direction in any direction. Select Zelda, and both her and Sheik's portraits appear at the bottom of the screen. Zelda's portrait will be glowing. Click on Sheik's portrait with , and it will start glowing instead of Zelda's. Also, Zelda's name will be replaced with Sheik's. Light Speed Jab She slashes two times then slashes forward very quickly. + + + + High Hook She kicks her leg highly. This move can chain itself together especially on fast fallers and heavies. + + + + Split Slice She holds up her leg then brings it down. Hits two times. + + + + Spin Kick Does a quick spin kick on the ground. while dashing while dashing while dashing while dashing Running Slash Throws her arms forward then forcefully spread them. Smash + + + (Smash + ) or (Smash + ) or Double Kick She unleashes two powerful kicks. Smash + + + (Smash + ) or (Smash + ) or Two-Way Slash She brings her hands down. This is Sheik's most powerful move and should be used to KO. Smash + + + (Smash + ) or (Smash + ) or Ninja Spin She does a spinning kick that resembles break-dancing. after grab after grab after grab after grab Ninja Punch Sheik punches her opponent. after grab after grab after grab after grab Ninja Elbow Sheik elbows her opponent away. after grab after grab after grab after grab Ninja Kick Sheik throws the opponent backwards and kicks them. after grab after grab after grab after grab Ninja Tip Sheik flips upside-down and kicks the opponent. after grab after grab after grab after grab Ninja Slam Sheik throws the opponent into the ground and kicks them downwards. Drop Kick Sheik does a kick that gradually gets weaker. + + + + Ninja Claw Sheik claws in front of herself. + + + + Back Kick Sheik kicks backwards. + + + + Ninja Drill Sheik drill kicks above her. + + + + Ninja Plunge Sheik drops down while kicking. Needle Storm Can store up to 6 needles. A versatile projectile attack. + + + + Chain Swing the control stick to whip enemies. Can also be used to tether recover. + + + + Vanish Just like in Super Smash Bros. Melee, an explosion occurs where she vanishes, making this an attack as well as a recovery move. It is a surprisingly powerful KO move, with good knock back, however it is difficult to aim and easy for an enemy to anticipate (since it has a long delay). + + + + Transform By using this move, you will transform into Zelda. + ( or )+ or or She pulls out her chain. + She steps back and strikes a pose. 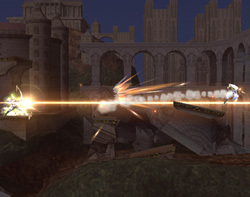 Light Arrow: Sheik draws a bow and fires the extremely powerful Light Arrow, which moves at light speed though opponents. Using Light Arrow as Sheik deals more damage and throws the opponents horizontally. Using Light Arrow as Zelda will deals less damage and throws the opponents in a 45 degree up angle. This page has been accessed 39,239 times.